In many cases symptoms experienced in the fingers are actully the result of problems in other areas of the body, such as the neck, shoulder, elbow or wrist. Problems in these areas, most notably problems that affect the nerves that run through these areas, can cause significant discomfort in the hand and fingers. Repetitive movements of the fingers (such as in keyboarding). Prolonged holding and clicking of the mouse. Keyboarding habits. Those who have a habit of striking the keyboard hard will have a greater tendency towards finger pain. 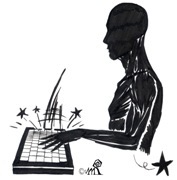 Positioning of your arms while keyboarding. Vigorous striking of the keys can contribute to finger pain. Trigger finger, and thumb, is a condition affecting the movement of the tendons as they bend the fingers (flexion) or thumb toward the palm of the hand. The tendons that move the fingers are held in place on the bones by a series of ligaments called pulleys. These ligaments form an arch on top of the bone that creates a sort of tunnel for the tendon to run in along the bone. To keep the tendons moving smoothly under the ligaments, the tendons are wrapped in a slippery coating called tenosynovium. The tenosynovium reduces the friction and allows the flexor tendons to glide through the tunnel formed by the pulleys as the hand is used to grasp objects. Trigger Finger is usually the result of a thickening in the tendon; this creates a nodule. There may also be thickening of the pulley ligament as well. The constant irritation from tendon repeatedly sliding through the pulley causes the tendon to swell in this area and create the nodule. Rheumatoid arthritis, partial tendon lacerations, repeated trauma from pistol gripped power tools, or long hours grasping a steering wheel can cause Trigger Finger. Infection or damage to the synovium also causes a rounded swelling (nodule) to form in the tendon. The symptoms of Trigger Finger or thumb include pain and a funny clicking sensation when the finger or thumb is bent. The clicking sensation occurs when the nodule moves through the tunnel formed by the pulley ligaments. Pain usually occurs when the finger or thumb is bent and straightened. Tenderness usually occurs over the area of the nodule - at the bottom of the finger or thumb. The finger can getted locked in the flexed "trigger" position (the nodule is too large to pass under the ligament). While not a formally defined repetitive strain injury, Mouse Finger has become a term to describe finger problems (usually pain) that result from extensive use of the mouse. 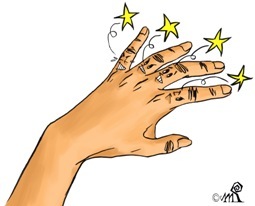 Most commonly, this is pain in the index finger or the forearm as a result of repetitive left-clicking. When symptoms appear in the forearm it is generally referred to as Tennis Elbow. Mice that do not require you to use a static grip. This includes touchpads, trackballs, RollerMice, and Mousetrappers. Before proceding to change your keyboard and mouse, consider your posture. Making improvements in posture can help you deal with problems in other areas, such as your fingers. How are you sitting; what is the height of your desk? Do you have to perch on the edge of your chair, or are you slouching? Are you twisting your neck to read a document? Are you twising your neck to hold the telephone while you type? Are you leaning on your desk while you type? Perhaps the most important consideration, when it comes to finger problems, is the position of your hands/arms while typing. With your elbows resting comfortably at your sides, the angle of the elbows should be ~90°. The wrists should be straight (not a lot of bending up or down). Supports come in many shapes and sizes, but the most common support is the wrist (or palm) rest that is placed in front of the keyboard. Use them for resting only (during breaks between typing). When typing there should be no contact between your wrist and the wrist rest. This will eliminate skin irritation due to rubbing the top of the rest. Do not lean into them. This puts a lot of pressure on the carpal tunnel area. 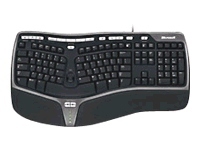 Some keyboards come with built-in wrist rests, which may be removeable. Some mice come with built-in wrist rests, which may be removeable. 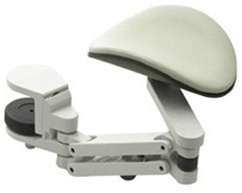 Some supports are articulating, giving full support throughout the typing/mousing range and eliminating rubbing. Try to change your typing style to one of light touching. Most keyboards require very little force to activate the keys. 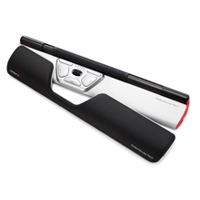 If your keyboard requires you to push very hard to actuate a key, the keyboard may need cleaning or it may be time to consider replacing the keyboard. Mechanical Keyswitch keyboards provide audible clicks and tactile feedback when the switch has generated a character. These keyboards allow for lighter touch and may be a good solution for people with a 'heavy' typing style. 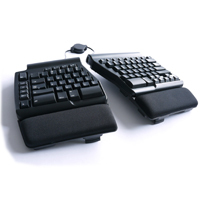 Adjustable keyboards that can be separated into two discrete segments allow you to move the two halves of the keyboard to get the optimum pain-free position. How you hold your wrists and forearms can contribute to finger discomfort. 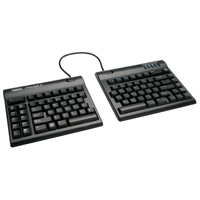 Adjustable keyboards provide the flexibility needed to find the most comfortable typing position. Change the hand you are using to operate the mouse, or alternate between hands. Contoured or vertical mice do not require you to hold your wrist in full pronation. Both reduce the amount of pronation (although to different degrees). Generally speaking, contoured and vertical mice require less finger strength to grip than a standard mouse. The fourth or ring finger (fourth digit) incurs prolonged stress when holding a standard mouse (the mouse is usually held between the thumb and fourth digit). This stress may aggravate trigger finger or other finger problems. Stationary mice (something you don’t have to hold while operating) such as Roller-style mice, trackballs, touchpads, or MouseTrapper mice (which uses a "steering" pad operated by a finger) can reduce the stress on the thumb and fourth finger. The index finger becomes irritated due to the repetitive action of left-clicking. This often results in symptoms generally referred to as Tennis Elbow. In common parlance, this is often called Mouse Finger. If you are considering a trackball, avoid models that force you to use the thumb to move the ball. 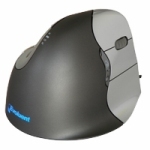 Choose a trackball that has the ball centrally located so that it can be manupulated with your fingers or palm. Also consider positioning the mouse in a central location so that it can be operated with either hand. A mouse operated by a different part of your body, such as a head-operated mouse, may work, although head-operated mice are not for everybody.